Hi. 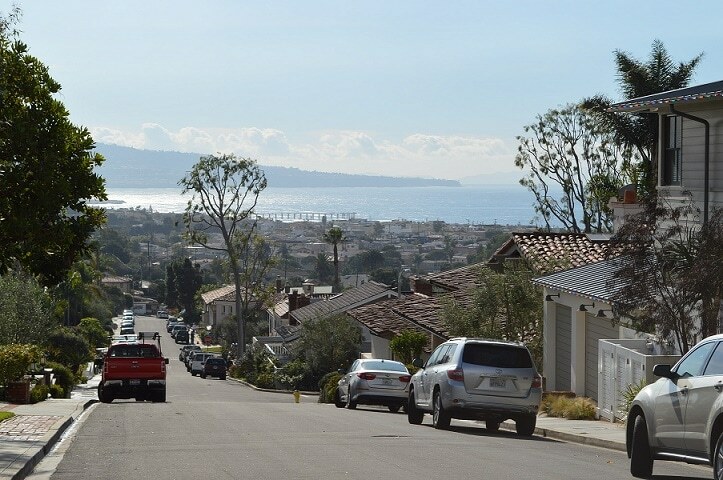 We’re driving today in Manhattan Beach, California, to visit a project recently completed by Coastal Custom Wine Cellars. When we were initially contacted in July 2014, we learned that the wine enclosure would be one aspect of a large renovation that was actually underway. So, we got started creating the Manhattan Beach Los Angeles wine cabinet in October. But long before we got started we met with the homeowners to discuss the refrigeration options, take some field measurements, and learn how he wanted to manage, display, and store his collection. The space is 15 ft. wide and 9 ft. tall. It’s quite beautiful, I think you’ll agree. The challenge was the depth of the area. 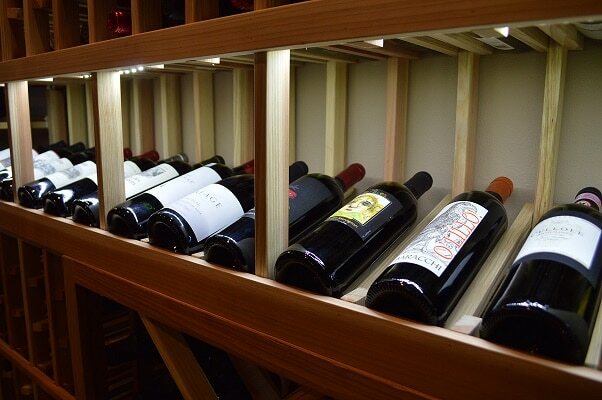 Our custom wine racks are 13 1/2 inches, so accessing bottles to the left and to the right would be difficult. As a result, we decided on a pair of the Barolo style glass doors that you just saw a picture of there to fill each of the two 64-inch wide openings. To make it easy to access the bottles where the fixed walls and fixed glass window were in place, we used label forward displays and some open bin storage much like the diamond bin we just looked at there. 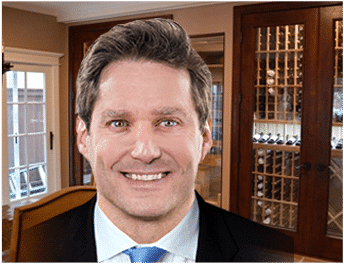 Our Barolo style glass doors include dual pane glass, weather stripping, and concealed door bottoms to ensure the wine cellar remains air tight. There are lots of finishes to choose from and lots of options. 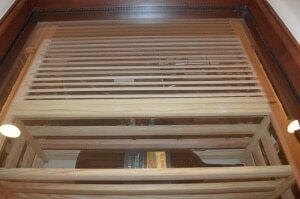 Our client selected our Chestnut finish that contrasted nicely with our Premium Redwood wine racks. The chestnut also blended really nice with the other color schemes of the opening dining and the kitchen area. To cool the wine cellar, you can see this louvered grill cover area right here behind the fixed glass window. 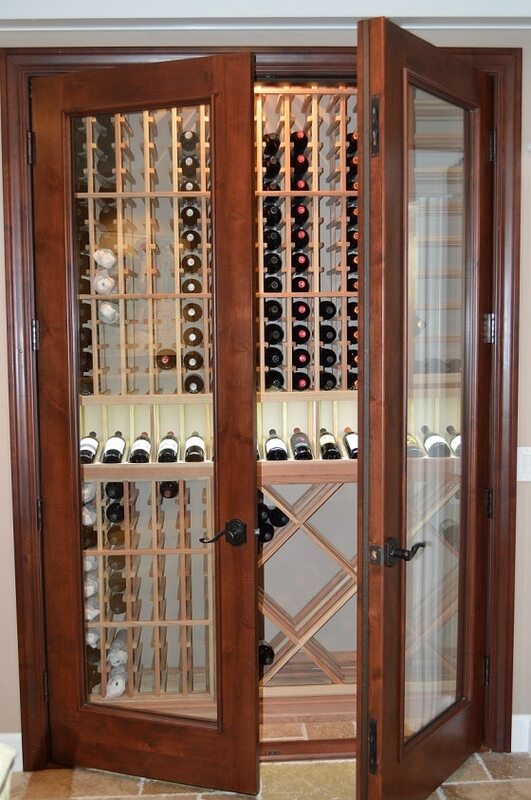 We utilized a split wine cellar refrigeration system. The evaporator is concealed behind that redwood grill cover and the condenser was placed in the garage. These condensers of this wine cellar refrigeration system can also be placed outdoors and they include exterior housing to protect them from the elements. The large 3-liter bottles were placed just below the grill cover here. They were label forward horizontal displays and some wood case openings were placed just below that. Those were actually flanked by some single bottle storage openings and large diamond bins were situated on the ends for bulk storage. All of our single bottle storage openings are 3 3/4″ x 3 3/4″ and our high reveal display rows allow for LED ribbon lighting to illuminate the displayed bottle and add a really nice touch to an already stunning wine display. Our client was so pleased with our customer service, project management, and our craftsmanship. He took the time to share his story at Yelp San Juan Capistrano and the design site known as Houzz. If you have a project we can help you with, please contact us at www.winecellarsbycoastal.com. Cheers!